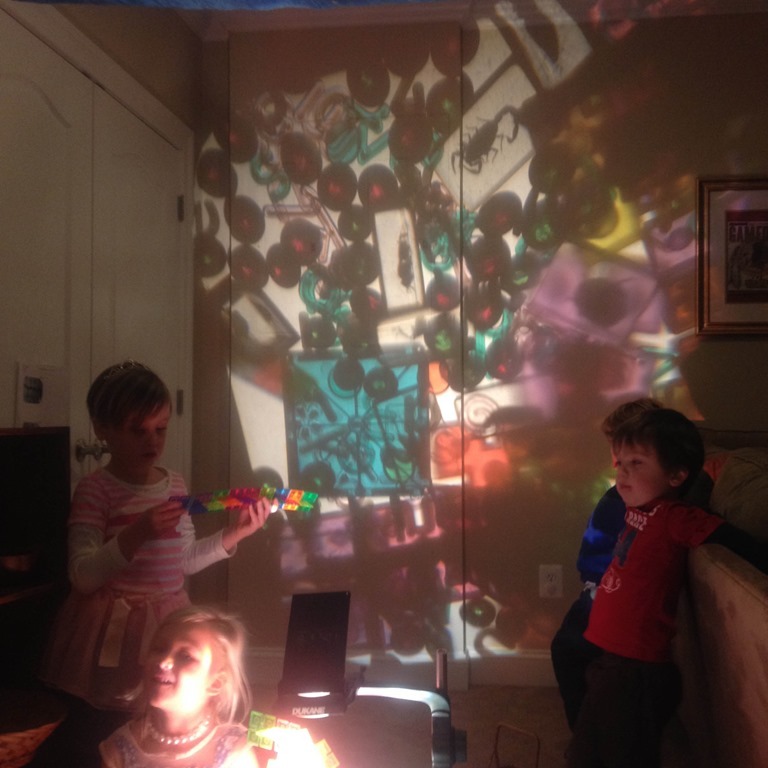 We have experimented with a few different set ups with our light and shadow project. 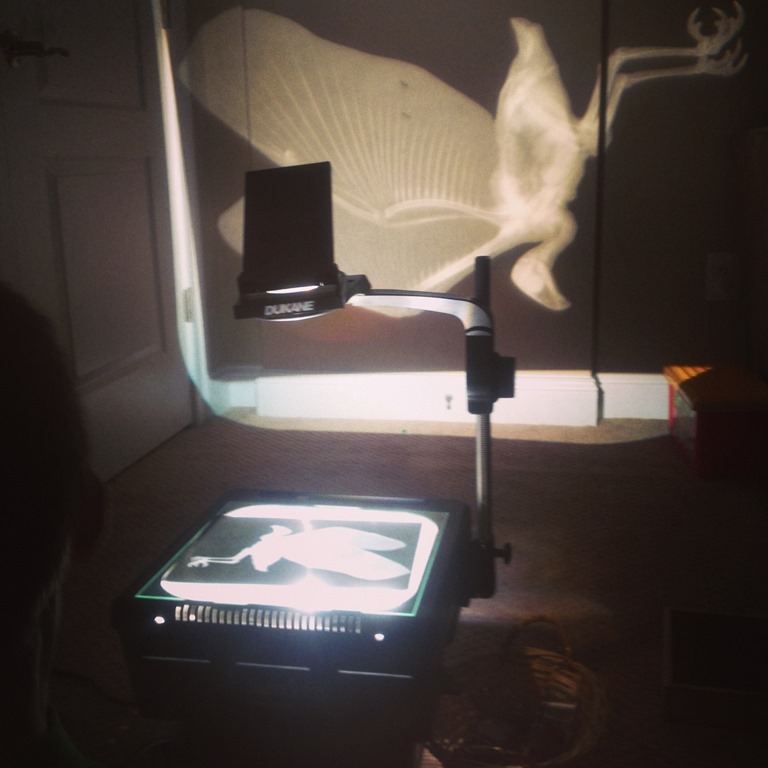 This year I tried a new approach to the overhead projector. I moved the projector to a high traffic area in our classroom, and hung up a sheet to give the students a nice clean image from the blocks and projector. 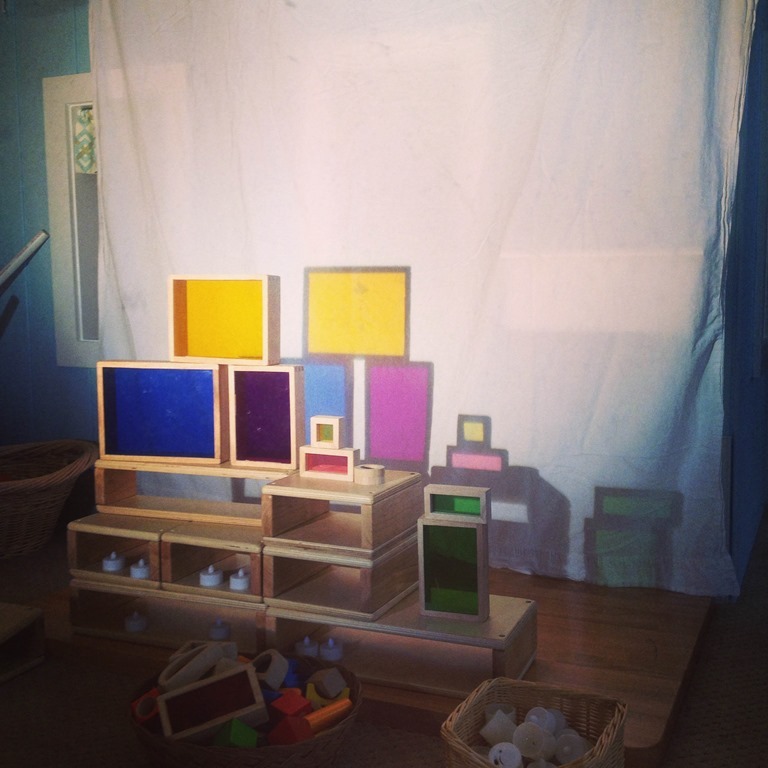 Then we stacked blocks on top of our platform to observe the change in shadows and colors on the screen behind the blocks. 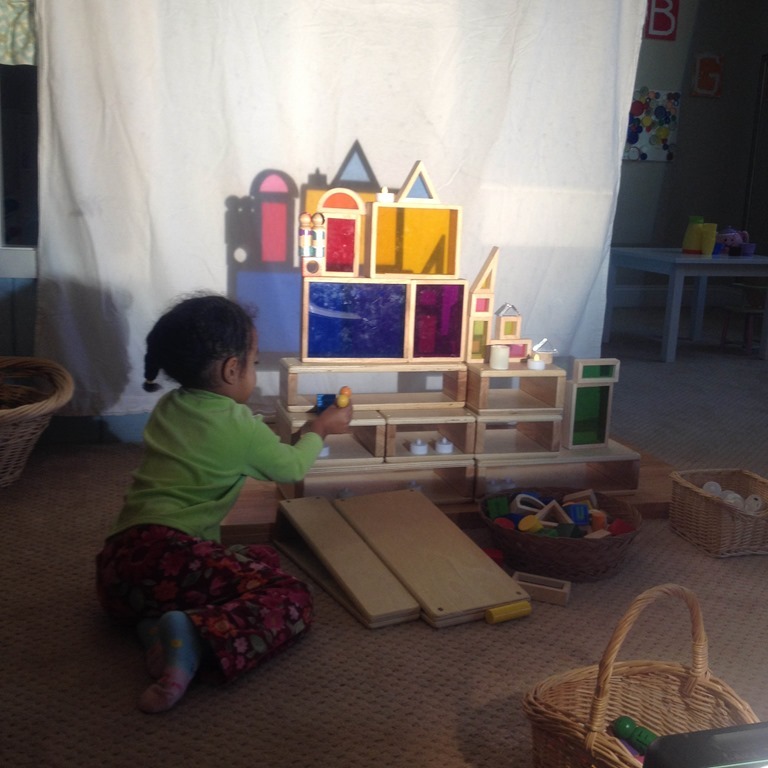 Of course we got busy playing with the blocks, adding different materials, putting up the tea light, and peg dolls. They got right to work. Later on I added the color lens basket to the overhead area, and this is what they did with all of the color disks. They also started to dance on the platform in front of the projector. 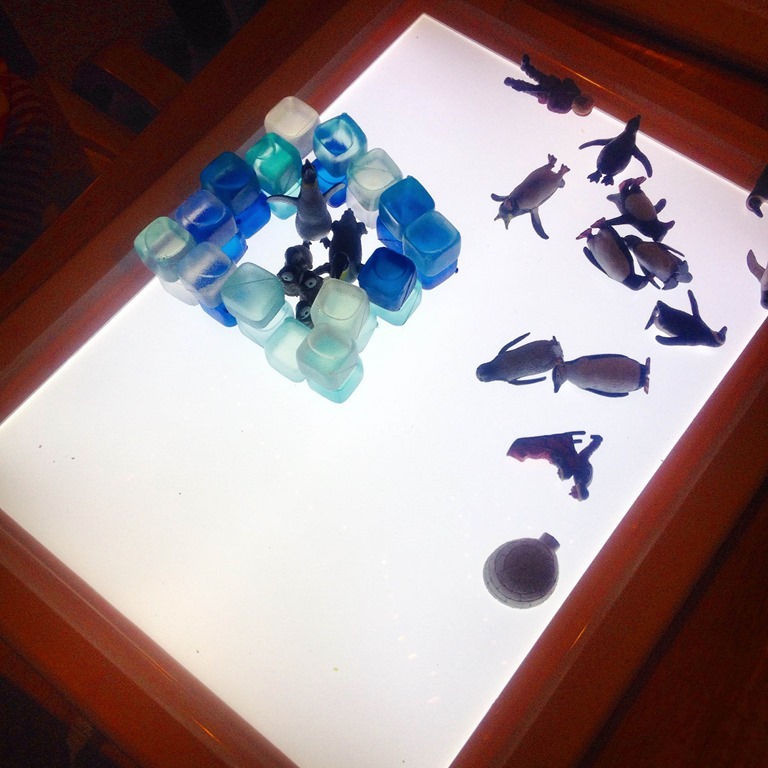 We explored penguins on our light table this January! 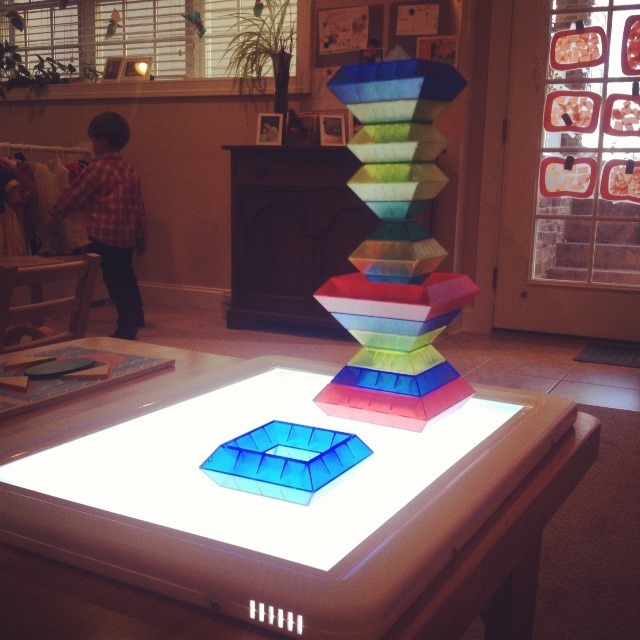 Played with gems, magnatiles, interlocking blocks on the overhead as well. The creations were quite spectacular! 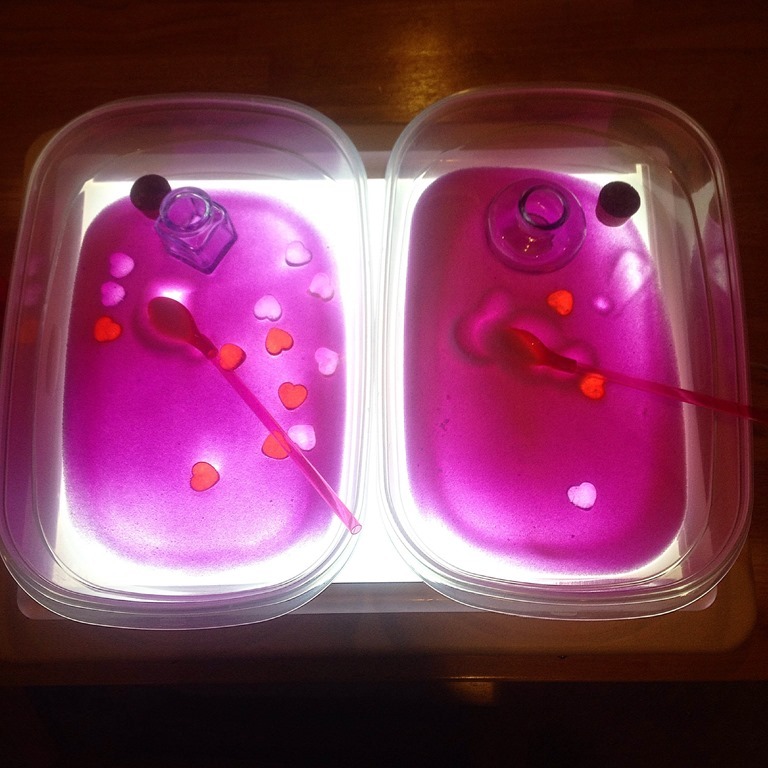 In February we explored pink dyed salt on the light table with heart gems and little glass cups. 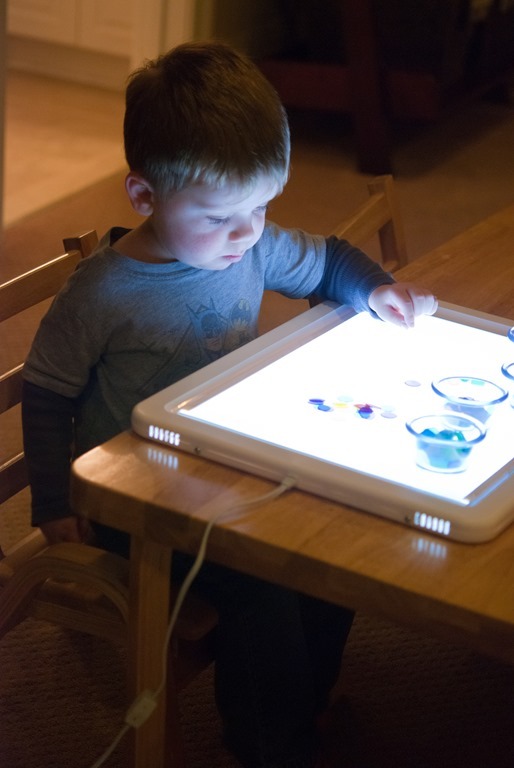 M always seems to be one of our most avid light explorers! I am excited to introduce a shadow puppet theatre this month to go along with our fairy tales unit. 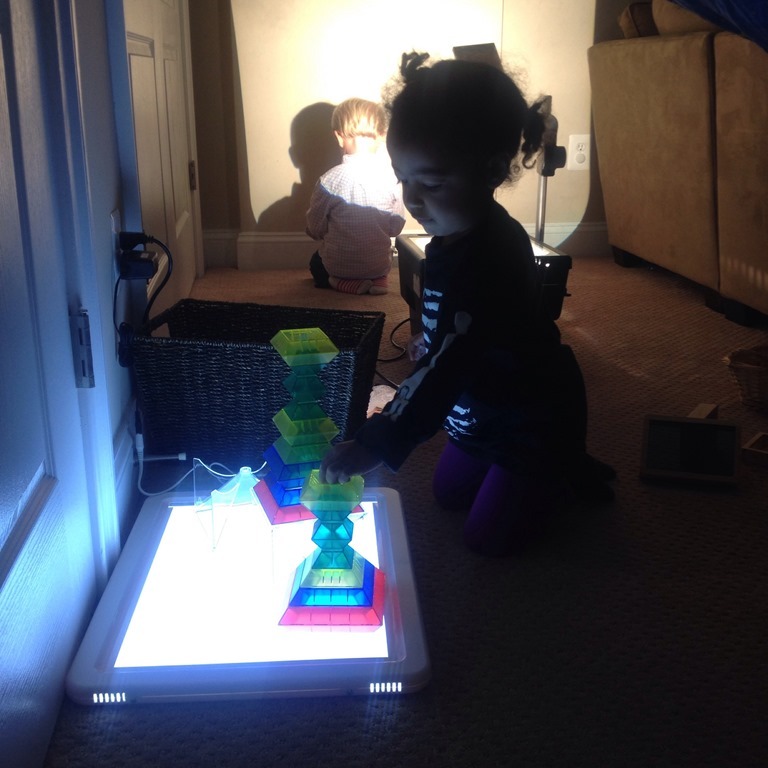 They always enjoy exploring light and it’s fascinating qualities in the classroom. 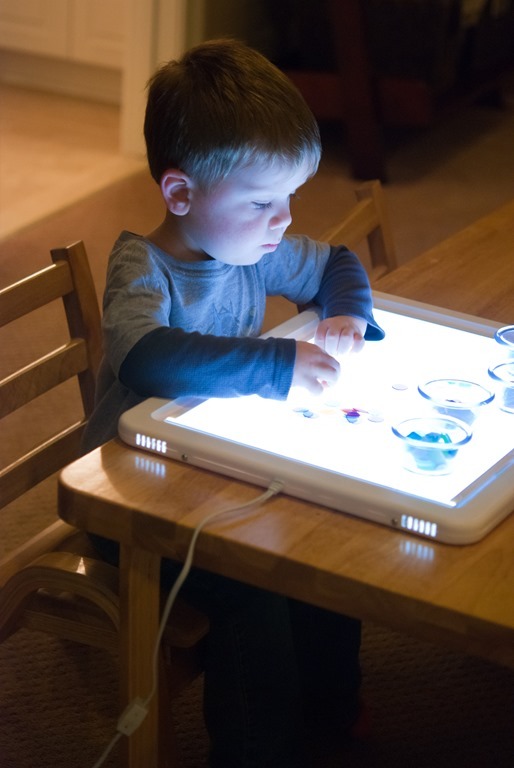 There truly are so many ways to use the light table and the overhead projector! 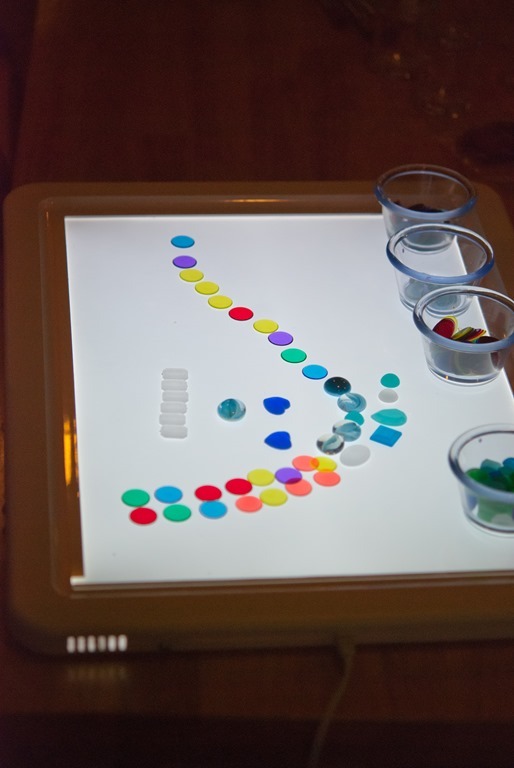 Categories: reggio emilia inspired, sensory play | Tags: light and shadow, light and shadow project, light table, overhead projector | Permalink. In October I opened up a new section of the classroom. It is our new light and shadows area. In reality, it is nook tucked away that provides the perfect wall space for the projector and I can keep the lights dim on that side of our classroom for children to explore! I opened the area with a long explanation about the projector, how we care for it, how to turn it on and off, and just how gentle we have to be with the glass. So far so good! I also bit the bullet and bought our very own light panel. I have had my eye on them for quite awhile. This one was on sale for $100, when it is usually $190! Steal?! 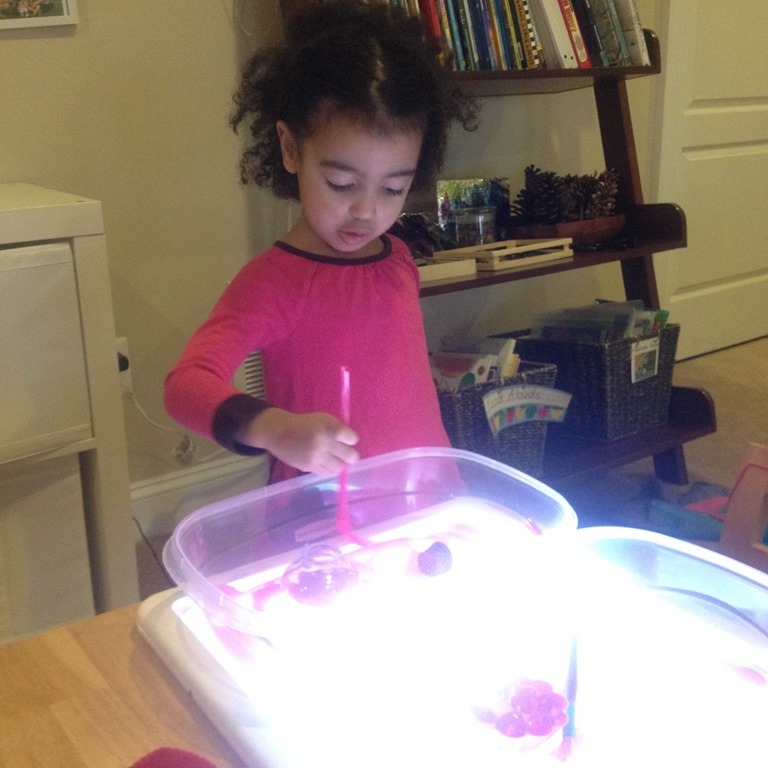 It has been such a great investment and so exciting to watch the children explore the light area. Of course on the first day M couldn’t have been dressed more perfect for our new area! She was wearing a glow up skeleton shirt for Halloween. She fit right in! 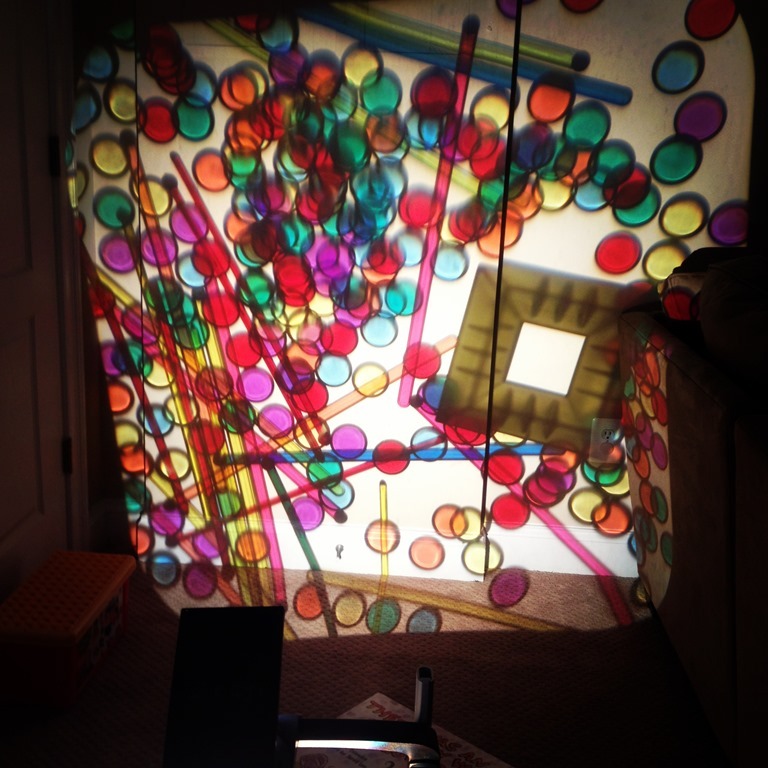 For now our exploration with the projector and light panel has focused on colors and loose parts. I provided the children with “swizzle sticks” from the dollar store and colored counters in a basket. 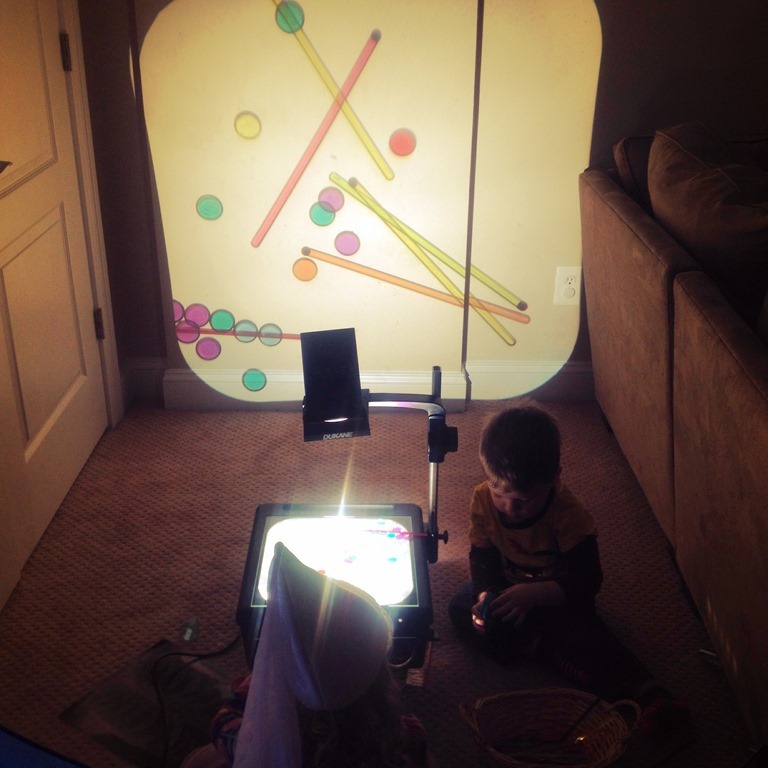 It was fascinating to watch them work with the projector and try to follow their images as it was projected on the wall. 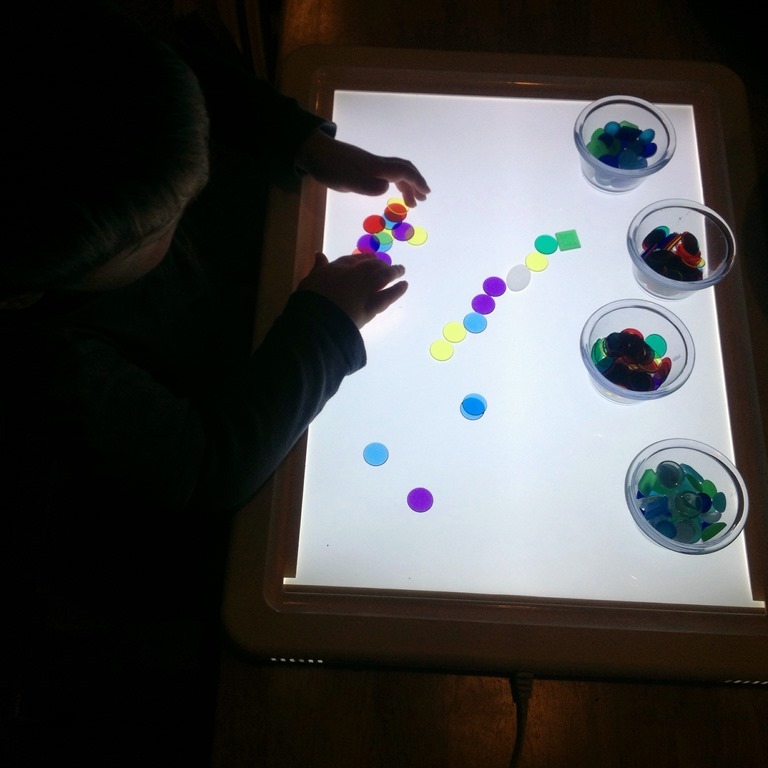 After about two weeks I moved the light panel to the table and provided a few cups of loose parts. Two cups had the colored counters, and the other two cups held some beautiful gems. They were invited to explore with them freely. L made an image of “Tangled” on the light panel. Pretty impressive! Some additional materials I provided for the children were “Wedgits” that are a wonderful stacking and building material. This set is also translucent and provides lots of fantastic reflections. During the month of October the children had been talking a lot about skeletons. They were interested in the skeletons in our Halloween books as well as the skeletons I provided in the sensory and gak play. I found two sets of x-rays on Amazon. One set was the human skeleton and the second set was animal x-rays. We looked at them together as a class over a series of a few mornings, and then I left them for the children to explore. I also put some skeleton books nearby by the projector for further reading and discussions. 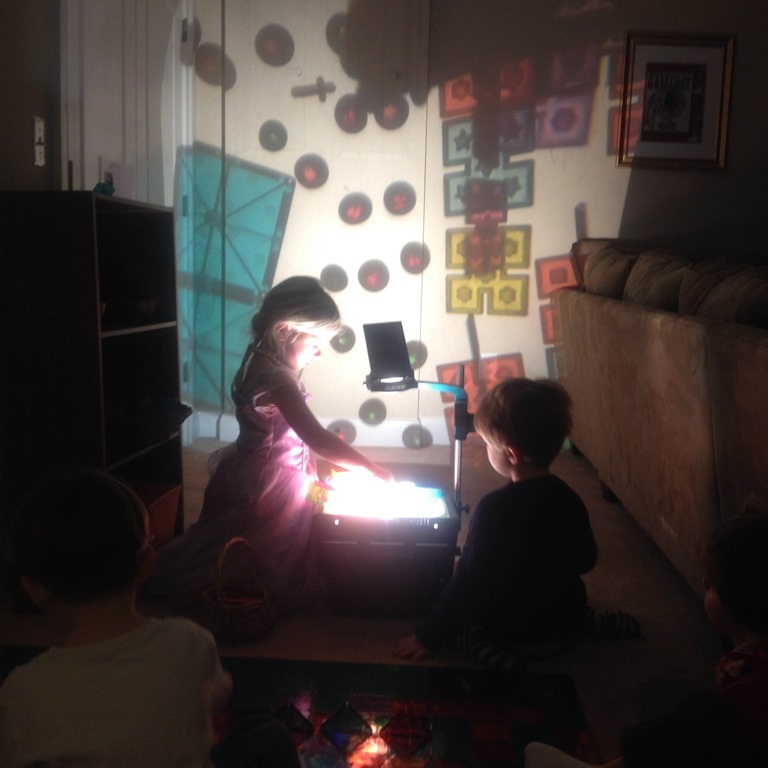 I am looking forward to seeing what comes next in our exploration of light and shadows. This will be an on-going theme this year with the children. 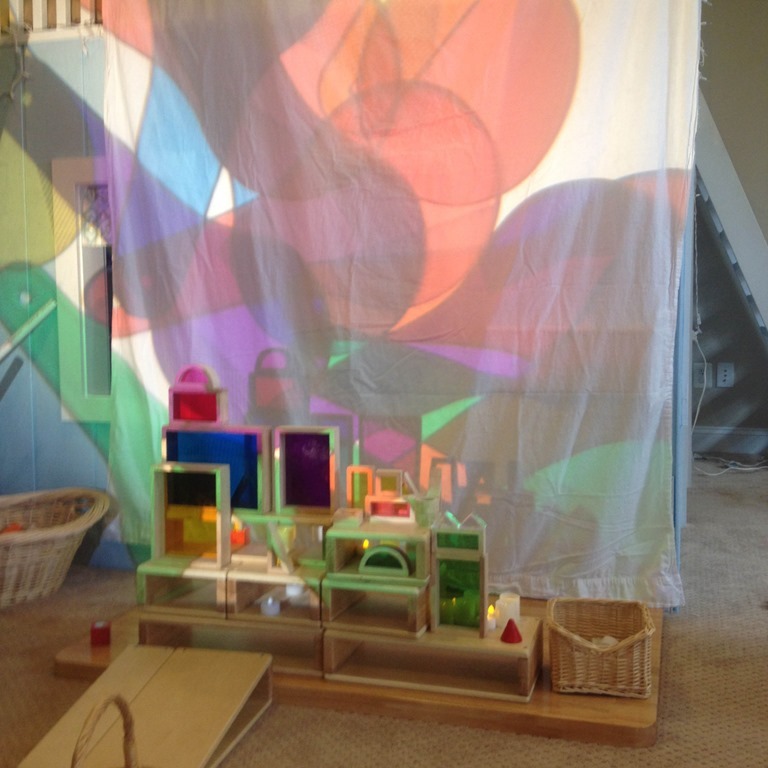 Categories: home based preschool, home preschool, preschool, reggio emilia inspired | Tags: light and shadow, light table, play based preschool, preschool, preschool science, reggio emilia, reggio inspired | Permalink.